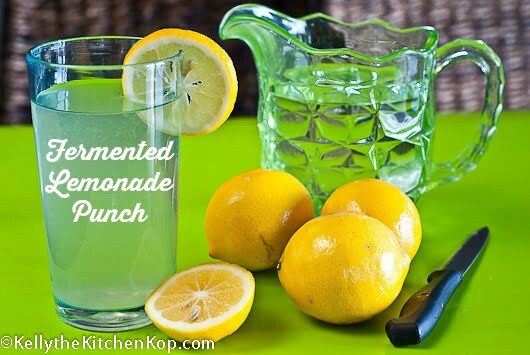 Fermented Lemonade Punch is the perfect summertime drink! With summer coming, you'll want to try this refreshing fermented Lemonade Punch recipe from the Nourishing Traditions cookbook. It takes a little time juicing the lemons, but if you have the right gadget it's not so bad (I like this inexpensive citrus juicer best). It's a simple recipe, and my family loved it. We rarely have anything besides milk, water, or homemade kefir soda pop these days, so it was a big treat! I want to try the recipe for the raspberry punch next, or you could do this with limes, too. 🙂 Fermented foods and drinks are very beneficial to our bodies because of the healthy bacteria and enzymes they produce for a healthy digestive tract, and the way they boost our immune systems! Read more from the Weston A. Price Foundation about the benefits of fermentation. Sally's recipe in the cookbook was for double this amount and she said to place all ingredients into a 2-quart glass container, but my 2-quart glass jars were filled to 3/4 with only half of her recipe, so the amounts above were just right for 2 quarts and it leaves you room to shake it up. Cover tightly and leave at room temperature for 2-3 days. Skim off any foam that may have risen to the top. Cover tightly and refrigerate. The punch will develop more flavor over time. (Note, if you use a darker sugar, it won't have a nice light yellow color – the gal who took the above picture for me must have used a lighter colored sugar. Have you tried this yummy and healthy smoothie recipe? Is Fluoride safe in our drinking water? Hi, I’m making a fermented lemon cleaner but one week in it smells so delicious, I googled to see if it would be edible and from these posts, it looks as if it may be. The recipe is 300g lemons, chopped up small enough to fit in a 2 litre bottle, 1/2 cup brown sugar and a teaspoon of dry yeast in water. Leave to ferment for two weeks, with the cap on loosely. Tighten cap and give a good shake once a day then remember to re-loosen the cap. I’ve had then just standing in the laundry at room temp. I’m in Western Australia and it’s mid winter here, so the room temp is probably 8-20degrees Celsius. There are bubbles, the liquid is a lovely lemony colour and so far no mould or floaty bits. Safe to try? Maybe diluted in some water? Sounds like it’s fine to me, but I don’t really know for sure. Sorry I’m not more help! Maybe google something like “dry yeast for fermenting” or something similar and see what you find. For non-dairy fermenting I’d try a “Ginger Bug” starter. I’ve been using it to make ginger ale and it’s great. My son is allergic to dairy products so I can’t use whey. What can I use instead? I see so many fermented drink recipes being posted for summer but not sure how to go about it without whey. Thank you do much!! We are allergic to dairy also. We make water kefir and add the fresh lemon juice after the fermentation process. Find instructions here: https://www.culturesforhealth.com/water-kefir. It sounds complicated but the grains are very hardy and once you’ve done it a couple of times it gets easier. We use two lemons per half gallon of water kefir. We were able to get grains from someone local that had extra, as they multiply over time. So eventually you can share some with others:) You can order the grains from the above mentioned website as well. My kids love water kefir. I tried to make this lemonade and it grew so much mold I had to throw it out. In fact, I’ve given up on even making whey because so much mold grows when I try to make whey :(. This happens both when making whey from raw milk or from pasteurized yogurt. I’ve bought this fermented lemonade from Millers Organic Farm but can’t afford to buy much of it. They follow the exact recipe in NT. Since I don’t drink fruit juice or soda any more, it’s such a treat. Well if you drink this… Then you DO drink fruit juice. Lemons are fruit. Lol. Hi Kelly – my question for you is where do I get whey? That is my biggest question. Do I have to make cheese to get it? I don’t make much cheese since we do not have extra raw milk laying around – we drink it all up! I can barely keep enough milk around to make yogurt. Any whey left from my yogurt is usually mixed back into the yogurt since there is never much. Thanks! I just added a link to homemade whey in the post, sorry about that, I meant to do it before and forgot. I was going to suggest draining the whey from yogurt (which also gives you a thicker, Greek-style yogurt) and then saw that you say you don’t get much. When I make yogurt it always is very viscous and runny, so I always let the whey drain out for 12 hours. I’ve also used whole milk, plain yogurt bought at the store to get the whey; the two brands I use are Stonyfield which is organic, or Trader Joe’s European style plain. I’ve been making this fermented lemonaide for a while, and we all love it! The last batch I let sit a little longer on the counter, as we went out of town. When we got back, it had a strong alcohol smell. Should I be concerned about giving this to my kiddos? How can I tell what the alcoholic content is? Love your website! Thanks for all the valuable info!!! can you drink as much of the juice as you want or would it be better to drink small amounts at a time like beet kvass? It probably depends on the person, you could always start out with a little and see how it goes. What is the difference between fermented limonade and lemon water kefir, except the taste! Well, I’m not sure, but my guess is that since one ferments with whey and the other with kefir grains, they probably each have different types of beneficial bacteria for your gut. Is the sugar disappear totally during the limonade fermentation ? If no, can I us Stevia in stead? The longer it ferments, the less sugar will be left and the more alcohol taste you’ll have. I don’t think Stevia would work, because the fermentation process needs sugar. Looking at this again, I should say that it really depends on the size of the lemons. 4 large lemons would be more like 1/2 c. or so, maybe more. More would just be more flavorful. I would not used bottled lemon juice. It is almost always pasteurized and not raw juice. I have made this fermented lemonade punch a couple of times and love it, but it gives me horrible heartburn. I am wanting to try making it with oranges instead of lemons. Since lemons give about 2-3 TBS juice per lemon, and oranges give about 6 TBS, should I make it with the juice of just 1/2 an orange, or use the juice of 4 oranges? Thanks for this! I am trying my first batch of fermented lemonde right now. One question… do I stir it like I do my ginger beer culture while it is at room temperature? Or should I leave it alone? Good luck! I’m hoping after a year on GAPS, we will get rid of out dairy allergies and get to drink some nice raw milk. yum. Cori, give me some more info and I’ll try to help. Are you looking specifically for a non-dairy fermented drink? Any ideas for people who can’t have dairy? My breastfeeding son is very sensitive to cow dairy and somewhat to goat as well. No whey for me for the next year or so – any help out there? I am wondering this same thing. I am allergic to dairy. Could I make this same drink with another culturing starter of some kind? I guess I could add lemon to water kefir or kombucha. Jessica, yep, there are a bunch of comments with good suggestions for you here. Can one use plastic water bottles that are BPA free(bought at Whole Foods) for making Lacto drinks? Honey doesn’t work so well for fermentation because it is naturally anti-bacterial. It may work eventually but it will be much slower than other sweeteners. Judging from the honey wine I tried recently (mead) it will taste a lot better just eating it from the spoon than using it for fermentation. I don’t know any reason why maple syrup wouldn’t work, but the flavor may be too strong, and even weird. The bland, plain sugars are ideal for fermentation because they don’t add their own flavor, you can easily flavor with fruits, spices, etc. Can you replace sugar with another sweetener such as honey or maple syrup? Many thanks for your quick reponse. I’m so excited…the Lemonade is sitting on my counter fermenting! I am enjoying all you have here for us to read. I’m your new fan!! Laura, yes, it will for the sugar added before it ferments, I don’t think so for the sugar added after. Kelly, will the sugar be converted into enzymes probiotics, etc. like Kombucha with this Lemonade? Can’t wait to try! 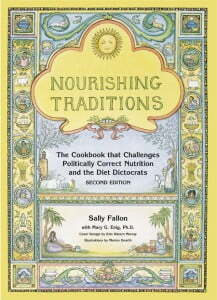 Even though I have Sally F’s cookbook, thanks for bringing to light a recipe I know everyone around here would love. I think that if you taste a bit of a fermented twang then it’s probably fine, but if you want to leave it longer, it won’t hurt it. Good luck! Beth, I see your questions were not answered from back in June – sorry! I was hoping Lynn would answer, because I don’t know what to tell you with that. Maybe she’ll see this one and be reminded and pop back in to answer. My punch was finished today and it tastes great! There wasn’t any foam or bubbling so I’m wondering if it is “done”. (I know that when I soak my oatmeal it usually has bubbles coming up in the liquid before I cook it.) I’m wondering if my punch might need to sit out longer. Any thoughts? Thanks so much for your input. I’m trying it again. I strained the whey as I poured it from the jar to measure it this time. One thing I noticed that I did wrong the other 2 times was that I filled the jar instead of *just* putting in the amount of water you said. So I probably put 1 cup extra water. This time I measured right. I’ll add water when it’s done to stretch it out. Since I only have quart jars I’m halving your recipe and just doing it in qt. jar. If I understand correctly, you wouldn’t add the apple cider vinegar until *after* it’s done fermenting, right? And then only if there was mold that I wanted to get rid of before drinking (after I skim out any I see)? Same with essential oils? After it’s done, or would you ferment it WITH the cider vinegar or essential oil? Rasberry punch…mmm. Let us know how it turns out! I finally got my NT from the library that had been checked out for at least a month on hold. I’ll go look it up right now. Kelly, my lemonade turned out great. It seems to get “bubblier” every day. I love the subtle carbonation. It reminds me of a drink that Pa might have had after a long day of field work in “The Little House” books by Laura Ingalls Wilder! Very refreshing and restorative. I’m so thankful to have someone like you to turn to for help with these things – thank you for being a great mentor! Those floaters might be teeny, tiny bits of protein from the whey starter culture. Maybe straining the whey through several layers of cheesecloth would help. It could also be mold; not all has odor or taste to humans. You could try a tsp. of raw cider vinegar to the finished product – it wouldn’t affect the taste but the acidity would make the mold unhappy. Also, a drop or two of a food-grade essential oil would completely get rid of the mold – lemon, orange, grapefruit, tangerine, cinnamon. I make a fermented non-dairy drink with washed kefir grains when I have extra. They can be trained to like glucose (rapadura) almost as much as lactose (milk) but they exhaust sooner and don’t proliferate. I’ve not observed mold on it, but there’s sediment on the bottom that goes into my garden, not my mouth. See Jessica Prentice’s FULL MOON FEAST for a lovely cooking book full of her interpretation of Sally Fallon’s and Dr. Price’s work. There’s recipes in there for fermented drinks. Keep up the good work, you fabulous young mothers!! When I make it there are definitely floaties and foam, but I skim off what I can and shake the rest up and just tell myself it’s pulp as I drink it. It has no off flavor, so I don’t think it’s mold. I’m not sure what’s happening with yours?! I know someone who may know (Lynn Cameron), I’ll e-mail her and ask her to post here. Great recipe! I halved your recipe because I only have 1 QT jars. The first time I made it there were a few white growths floating on top that looked like mold. I skimmed them off and drank it. It was refreshing and delicious. I wondered if it was because I used the plastic lid instead of the ring and it wasn’t a tight seal. Well, this morning (on my second batch, second day) I found a bunch of white moldy-looking round floaties and I used a ring lid this time. Does that happen to you also when you make this? I’m still getting use to the whole lacto-fermenting thing. The white floaties are most likely yeast, which occurs naturally and is responsible for the fermentation.